STAHL CraneSystems supplies first-class crane technology, but only to crane builders. Since the beginning of 2009 we have no longer built crane systems ourselves. Instead, we have specialised on developing and building high-quality lifting, drive and control technology. Everything else – customer advisory services, planning, building the crane systems, servicing and spare parts supply – is left to the competent crane builders on the ground. That’s what we call logical. The crane builder doesn’t need to fear us as competitors and at the same time profits from the expertise gained in our 115 years in crane building and explosion protection. 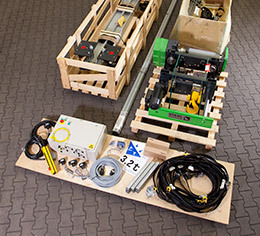 Anyone who orders a CraneKit from STAHL CraneSystems receives more than a crate full of high-quality crane technology: he gains a powerful partner for the whole volume of work. The crane manufacturer on the ground advises and sells. The crane builder on the ground develops and designs. STAHL CraneSystems supports him with its engineering department and expertise. STAHL CraneSystems supplies the matching CraneKit. STAHL CraneSystems supports him with its own factory service centre and training courses.